I’m covered ankle to waist in red mud over my jeans and shirt. I spent all afternoon pulling patients out of a calf-deep creek, then kneeling in the mud to work on taking vitals and treating insults & injuries. Okay, not a real patient, but rather a scenario in my 10-day Wilderness First Responder (WFR) course. WFR is an extensive course in extended-care first aid. The curriculum covers injury prevention and treatment in the backcountry (defined as a significant distance from definitive care, i.e. a hospital). Since we moved into the van, Joffrey and I mutually have known two separate people who died on solo trips. Both events were supposed to be “day hikes”. Both people were extremely experienced and fit outdoors people. 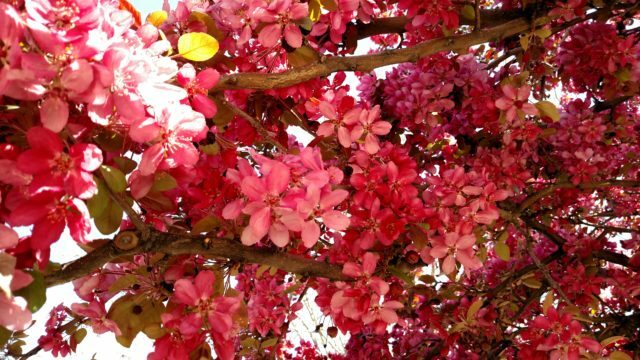 These deaths have been a jolting reminder of the realities and responsibilities of being outside. Taking a WFR course this year is an important part of our personal growth, our growth as a team, and as a way to meet a community challenge proposed in memoriam of one of our friends: find an outdoor skill to improve in order to become a more complete outdoorsperson. Annie strapped to a backboard. 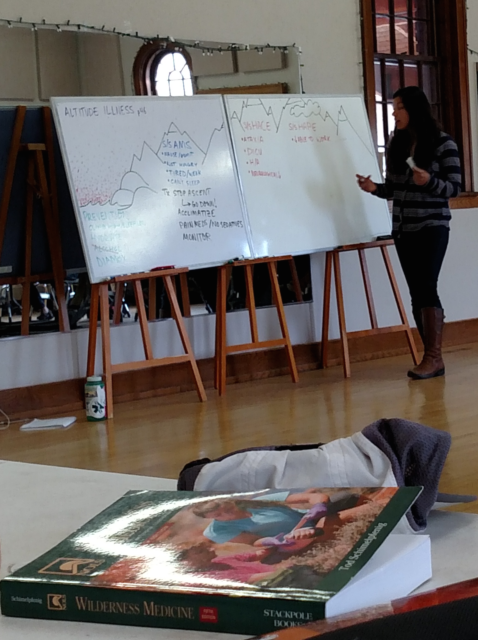 Lauren teaching us about Altitude Illness & her amazing board artwork. Every class day is long, but highly entertaining and engaging. We cover care for common injuries (abrasions, ankles, blisters…) as well as less common but more serious threats (femur fractures, HACE, lightning strike…). NOLS structures their courses as a combination of classroom style learning, scenarios and experiential learning. We act as patients and rescuers multiple times a day, rather than just learning from textbooks. Bad jokes and puns are pretty much non-stop. We practice splints, laceration dressings, and blood pressure and vitals readings on each other. 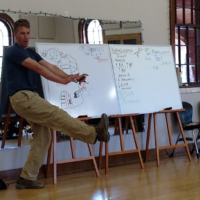 I have never had a bad WMI instructor in all the courses I’ve taken through NOLS. This course’s instructors – Brian and Lauren – were no exception. I was really happy to be retaking a full 10-day course because it clarified recent changes to WFR protocols, and strengthened my muscle memory of the patient assessment system in a way that three-day long recerts don’t. 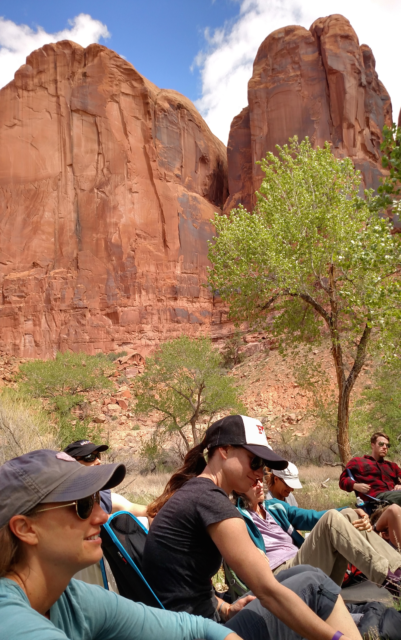 Moab provided the prettiest classroom. Another fantastic benefit of taking the course is that they are offered in some of the coolest places in the country – like Moab! I have also met some of the most fantastic people during my courses and recertification. It’s a great way to be immersed with a big group of like-minded people for 10 days. At this course, most people were living out of their vehicle, worked for National Parks, guided trips, and were all out well-rounded adventurers. Joffrey met two new climbing friends to hit up Indian Creek with, and I went hiking with a badass lawyer just beginning her year-long road trip and a whitewater photographer. It was a great break from being isolated in the van with Joffrey, and we got great advice on more things to do in the Southwest. 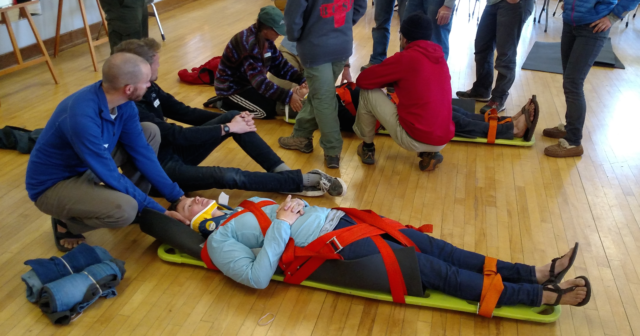 We chose NOLS Wilderness Medicine Institute as our course provider, because they’re the best! There are a few other reputable wilderness medical schools*, and I highly recommend one that follows the most updated and evidence-based curriculum possible. WMI meets and exceeds those requirements. They are constantly critiquing, questioning, and improving their own curriculum based on extensive data that NOLS collects from its fieldwork, as well as the best medical information available. I was really pleased to see the NOLS added a “mental health first aid” component, and I got to practice doing injections and working with ampules/needles for the first time. Brian teaching us about how insulin is the key to sugar dispersal in our bodily fortress. Class was never dull. Overall, it was a well worthwhile 10 days. 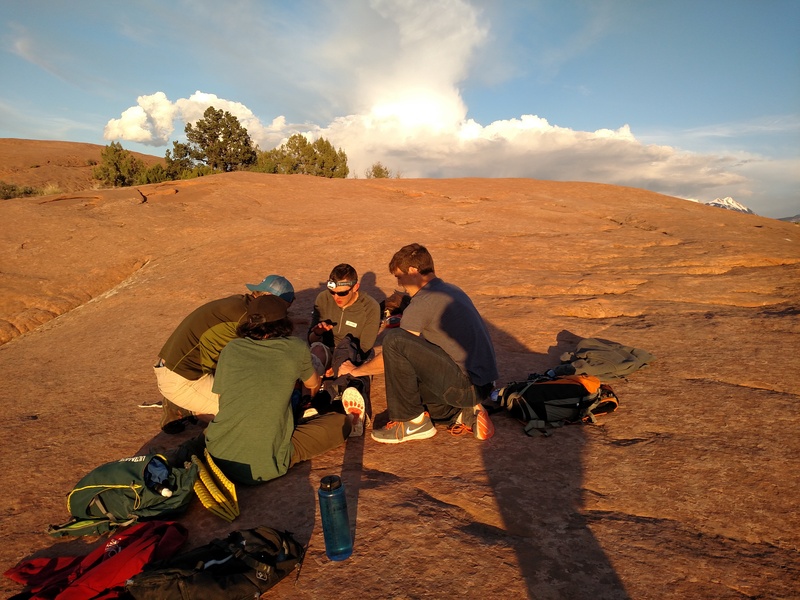 We rocked out in Moab, embraced the free camping, ate dinner with an old college friend, went hard during scenarios (including an awesome extended-care late-night scenario), and learned a ton. I highly recommend doing this course (or at least a 3-day WFA) for anyone getting out in the backcountry regularly. Joffrey and I are really looking forward to applying to volunteer for a search and rescue crew in New Hampshire in August. *I took my original course with SOLO, also the best! SOLO follows the same standards and almost identical curriculum to WMI, and their certifications are interchangeable. That means that if you originally were certified through one organization, you can maintain your standing even if you have to take a re-certification course with the other organization.